This beautiful Twin Stem Phalaenopsis Orchid is presented in a very stylish czinc pot. This is the UK's number 1 favourite plant. The Twin Orchids are ideal for any occasion and are very easy to look after as they enjoy the same conditions as we do. They may arrive in bud form so that the lucky recipient can enjoy them for even longer. 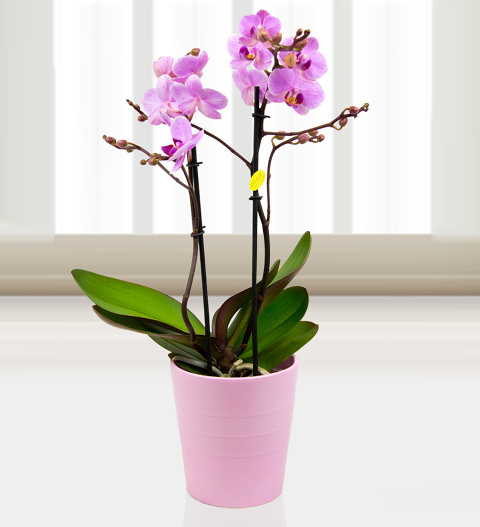 The Twin Orchids are available for next day UK delivery; Colours may very due to seasonal availability.
' Chocolates may contain nuts.